JAX ZOO Black Jaguar button. Jax Reads! Button. Jacksonville Cares about children button. 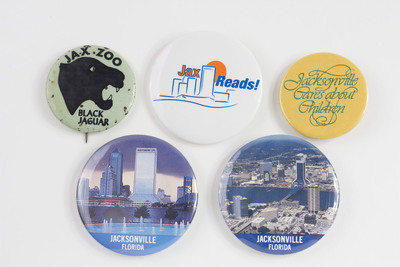 Jacksonville Florida, Independent Life Building skyline button. Jacksonville Florida, downtown Jacksonville with the John T. Alsop Jr. Bridge (Main Street Bridge) button.